BACKGROUND: read Efron and Tibshirani (1993); Tauxe et al. (1991). Paleomagnetists have depended since the 1950’s on the special statistical framework developed by Fisher (1953) for the analysis of unit vector data. The power and flexibility of a variety of tools based on Fisher statistics enables quantification of parameters such as the degree of rotation of a crustal block, or whether the geomagnetic field really averages to a geocentric axial dipole independent of polarity. These tools, however, require that the paleomagnetic data belong to a particular parametric distribution – the Fisher distribution. In many important situations, the Fisher distribution fails to represent paleomagnetic data adequately. To begin with, the geomagnetic field itself can produce directions that are far from Fisher distributed. Most statistical paleosecular variation models generate spherically symmetric distributions of the VGPs (see, e.g., Figure 12.1a). When converted to equivalent directions, they are more elongate as the observation site approaches the equator (see Figure 12.1b). Because VGPs that are farther from the pole are associated with weaker field strengths in collections of paleomagnetic data and in many models of the field, the Fisher assumption of unit vector length over-emphasizes the importance of the “outliers” and leads to mean inclinations that are shallower than the true mean (see e.g., Creer, 1983). Another example of the inadequacy of the Fisher distribution is the fact that the magnetic field exists in two stable polarity states. Because the Fisher distribution allows only uni-modal data, bi-polar data must be separated into separate modes or one mode must be “flipped” to the antipode prior to calculating a mean. Remanence vectors composed of several components tend to form streaked distributions. Structural complications (e.g., folding) can lead to streaked distributions of directional data. And, inclination error arising from flattening of directions tends to form “squashed” directional distributions that are wider in the horizontal plane than in the vertical. These are all commonly observed pathologies in directional data sets that lead to non-Fisherian data distributions. Thus, non-Fisherian data are a fact of paleomagnetic life. The Fisher-based tests can frequently be inappropriate and could result in flawed interpretations. In Chapter 11 we learned the basics of Fisher statistics and how to test data sets against a Fisher distribution. In this chapter, we will discuss what to do when Fisher statistics fail. We will begin with parametric approaches that treat certain types of non-fisherian data. We then turn to the use of non-parametric methods such as the bootstrap and jackknife in paleomagnetic applications. The mean direction in a Kent distribution is estimated in the same way as for the Fisher distribution (see Chapter 11). The difference is that when transformed to the mean direction, Kent declinations are not uniformly distributed around the mean. If we calculate eigenparameters for the orientation matrix of the data (see Appendix A.3.5), then the major and minor eigenvectors (V2,V3) lie in a plane orthogonal to the mean direction along the axis with the most and least scatter respectively. In Equation 12.1 α is the angle between a given direction and the true mean direction, and ϕ is the angle in the V2,V3 plane with ϕ = 0 parallel to V2. κ is a concentration parameter similar to the Fisher κ and β is the “ovalness” parameter. c(κ,β) is a complicated function of κ and β. When β is zero, the Kent distribution reduces to a Fisher distribution. Details of the calculation of Kent 95% confidence ellipse are given in Appendix C.2.4. If we were to collect data from the equatorial region, we might well obtain a set of directions such as those shown in Figure 12.2a. [Note that the center of the diagram is the expected direction – not down as is more common.] The Fisher α95 circle of confidence for this data set is shown in Figure 12.2a. The Kent ellipse (Figure 12.2b) clearly represents the the distribution of data better than the Fisher α95, being elongate in the same sense as the data themselves. Figure 12.2: a) An example of data obtained from a hypothetical equatorial sampling site plotted with the Fisher circle of confidence. The data have been transposed such that the expected direction (0, 0) is at the center of the diagram and “up” is at the top. b) Same data but with the Kent 95% confidence ellipse. c) Data from a) with some directions transposed to the antipode; directions plotted with the Bingham 95% confidence ellipse. where α and ϕ are as in the Kent distribution, k1,k2 are concentration parameters (k1 < k2 < 0) and d(k1,k2) is a constant of normalization. Values for k1,k2 can be estimated by numerical integration and can be converted into 95% confidence ellipses, the details of which are given in Appendix C.2.5. In a nut shell, the V1 eigenvector of the orientation matrix (associated with the largest eigenvalue, see Appendix A.3.5) is the principal direction and the semi-axes of the 95% confidence ellipse are proportional to the intermediate and minimum eigenvalues. The Bingham principal direction therefore is not necessarily the same as the Fisher or Kent mean. If we take each vector end-point to be a mass, the Bingham principal direction is the axis about which the moment of inertia of the masses would be least. The Fisher mean is somewhat different, in that it is the vector sum of unit vectors. The Bingham mean (principal direction) is less affected by outliers than the Fisher mean, lying closer to the center of mass of data points. The principle drawback of the Bingham distribution is that because the orientation matrix uses the entire data set (normal and reverse) the two modes are assumed to be antipodal and to share the same distribution parameters. The question of whether normal and reverse data sets are antipodal and have the same dispersion is in fact one we may wish to ask! One could separate the two modes prior to calculation of the Bingham ellipse, but then the rationale for using the Bingham distribution is lost. Also, many published descriptions of the Bingham calculation (e.g., Onstott et al. 1980, Borradaile, 2003) have errors in them. The source code for calculating Bingham statistics in widely used paleomagnetic data reduction programs is generally not available, and it is unknown whether these programs contain bugs. Estimating the parameters for the Bingham ellipse exactly is computationally taxing and all of the available “canned” programs use the look up table of Mardia and Zemroch (1977; see Appendix C.2.5). LeGoff et al. (1992) suggested some approximations which may be valid for concentrated distributions. They also introduced the concept of weighting results according to some reliability criteria. For the general case, however, it seems preferable to use the exact Kent (1982) ellipses on uni-modal data sets. These could of course be weighted if such weighting is desired. Figure 12.3: A bi-gaussian set of vectors suitable for treatment using the method of Love and Constable (2003). Until now we have continued the Fisher assumption of unit vectors. As already mentioned, neglect of the vector strength can lead to bias. Love and Constable (2003) began the hard work of incorporating intensity information into the parameter estimation problem. Their method can handle bi-modal spherical Gaussian data such as those shown in Figure 12.3. Estimation of the Love parameters are beyond the scope of this book. Moreover, many data sets are not spherically symmetric as already noted and the Love and Constable (2003) approach must be generalized to elliptical, more “blade-like” data sets than the “cotton balls” currently treatable. Figure 12.4: a) Hypothetical non-Fisherian data set. Normal and reversed polarity data that are not symmetrically distributed. Filled (open) circles plot on the lower (upper) hemisphere. b) Equal area projection of 500 bootstrapped means for pseudo-samples drawn from the data shown in a). c) Same as a) but with the bootstrapped confidence ellipses shown. As we have mentioned, real data may be pathological in several respects including bi-modal and elliptically distributed data. None of the methods we have described so far have the test for common mean so critical to paleomagnetic studies nor can they provide confidence ellipses for an off-center mean direction as is likely to occur in records of the geomagnetic field (see Figure 12.1b). Finally, data may be overprinted or contain the record of a paleomagnetic transition, resulting in “streaked” or non-antipodal distributions, conditions that make the conventional methods inappropriate. In this section we will discuss alternative methods for estimating confidence bounds which are sufficiently flexible to accomodate all of these short comings, provided the data set is large enough. In Figure 12.4a we show a not unusual “not great” paleomagnetic data set. The data are elliptical, bi-modal and one has the suspicion that the normal and reverse modes may be neither antipodal nor share the same concentration or ovalness parameters. Clearly some non-parametric approach would be desirable. The approach for characterizing uncertainties for vectors we will take here is based on a technique known as the statistical bootstrap. As we shall see, the bootstrap has the flexibility to allow us to treat awkward data sets like that shown in Figure 12.4a. The principles of the bootstrap are given in Appendix A.3.7. In essence, the parameter of interest (say, the mean vector) is calculated from many resampled data sets, whose data points are selected at random from the original data. The bootstrapped estimates “map out” the likely distribution of the parameter, allowing estimation of confidence regions. Before we extend the bootstrap from the scalar treatment in Appendix A.3.7 to vectors, it is important to point out that with the bootstrap, it is assumed that the underlying distribution is represented by the data, demanding that the data sets be rather large. Moreover, the bootstrap estimates are only asymptotically valid, meaning that a large number of bootstrap calculations are required for the confidence intervals to be valid. It’s a good thing we have fast computers with huge hard-drives. There are a variety of ways we can use the bootstrap to estimate confidence regions for paleomagnetic data. We will start with the most “Fisher” like approach of taking unit vectors of a single polarity. Then we will accommodate dual polarity data sets and develop analogous tests to those so useful for Fisher distributions. To do a simple bootstrap on a data set with only one polarity (say the normal data in Figure 12.4a, we first randomly draw N data points from the data shown in Figure 12.4a. Each set of N data points is a pseudo-sample. Note that some data points will be drawn more than once while others will not be drawn at all in a particular pseudo-sample. We then calculate a Fisher mean of the pseudo-sample (one little circle in Figure 12.4b. This resampling procedure can be repeated many times. We show 500 such bootstrapped means in Figure 12.4b. Now we can estimate the region of 95% confidence for the bootstrapped means. A non-parametric approach would be to draw a contour enclosing 95% of the bootstrapped means. In many applications, paleomagnetists desire a more compact way of expressing confidence regions (for example, to list them in a table) and this necessitates some parametric assumptions about the distribution of the means. For this limited purpose, approximate 95% confidence regions can be estimated by noting the elliptical distribution of the bootstrapped means and by assuming that they are Kent (1982) distributed. Such bootstrap confidence ellipses are shown in Figure 12.4c. When paleomagnetic data are bimodal, as in Figure 12.4a, we can proceed in one of two ways. We could just calculate the principal eigenvector of the orientation matrix (V1) as in Bingham statistics of each bootstrapped pseudo-sample or we can separate the data into two modes and calculate Fisher means for each mode separately (as in Figure 12.4b). To separate the data into normal and reverse subsets, we first calculate the principle direction of the whole dataset. This will be more or less parallel to the Fisher mean of one of the modes. Any direction more than 90∘ away from this could be placed in the second mode. After separation, Fisher means of the bootstrapped pseudo-samples can be calculated for each mode separately. Alternatively, if a more robust estimate of the “average” direction is desired, one could calculate the principal eigenvector V1 of each mode, which is less sensitive to the presence of outliers. Figure 12.5: Test for common mean with two directional data sets. a) Equal-area projections of two simulated Fisherian data sets (triangles and circles) each with κ of 20. b) Means and α95s of data sets shown in a). The bootstrap just described is a “simple” or “na�ve” bootstrap in that no distribution is assumed for the data. We did assume, however, that all the uncertainty inherent in the data is reflected in the data distribution. If the data set is smaller than about N = 20, this leads to uncertainty ellipses that are too small (Tauxe et al., 1991). Many paleomagnetic data sets are smaller than this, yet they are demonstrably non-Fisherian. Luckily, if we are able to assume some parametric form for data from e.g., a given site, we can use a superior technique which is known as the parametric bootstrap. As applied here, we assume that each site with N samples is Fisher distributed (in principle, a testable assumption). Then, after random selection of a particular site for inclusion in the pseudo-sample, we draw N new directions from a Fisher distribution with the same mean direction, κ and N. From these simulated data sets, we calculate a substitute mean direction, and use that in the pseudo-sample. Otherwise, we follow the same procedure as in the simple bootstrap. For large data sets (N > 25), the parametric and simple bootstraps yield very similar confidence ellipses. For smaller data sets, the parametric ellipses are larger, and are probably more realistic. Figure 12.6: Cumulative distributions of Cartesian components of the bootstrapped means from 500 pseudo-samples from data shown in Figure 12.5. a) X components. b) Y , and c) Z. Also shown are the bounds for each data set that include 95% of the components. The confidence intervals for the different data sets overlap for X and Z but not for Y . The test for a common mean addresses the question “can the means of two data sets be discriminated from one another?” Another way of putting it is, “If a set of bootstrap means is examined, are there two distinct groups or is there just one?” We explore these ideas by considering the same Fisherian data sets we used in Chapter 11 for the Watson’s V w test. In Figure 12.5 we show two data sets (triangles and circles), each drawn from distributions with a κ of 20. The mean direction of each lies outside the confidence region of the other and the V w test of Watson (Chapter 11) has a value of 11.7 with a critical value of 6.3; hence the data sets fail the test for a common mean. In order to develop a bootstrap test analagous to the V w test for use on non-Fisherian data sets, we first convert a set of bootstrapped mean directions to Cartesian coordinates. Cumulative distributions of the Cartesian coordinates of the bootstrap means are shown in Figure 12.6a-c along with the bounds containing 95% of the means for each data set. The two sets of directions are distinct in the Y component, confirming that the two means can be distinguished at the 95% confidence level. 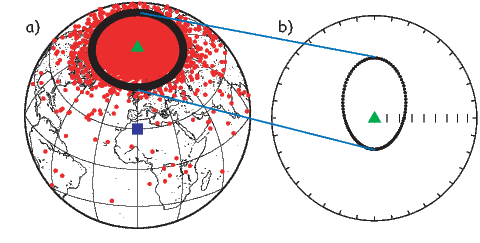 The so-called reversals test in paleomagnetism constitutes a test for a common mean for two modes, one of which has been “flipped” to its antipode. We apply our bootstrap test for common mean to the data shown in Figure 12.4. The cumulative distributions of the Cartesian coordinates of the bootstrapped means are shown in Figure 12.7. The confidence intervals for the normal and reverse antipodes overlap, thereby suggesting that the two means cannot be distinguished at the 95% level of confidence. Thus, the data in Figure 12.4 pass the bootstrap reversals test. Figure 12.7: Cumulative distributions of Cartesian coordinates of means of pseudo-samples drawn from the data shown in Figure 12.4a. The reverse polarity mode has been flipped to its antipode. The intervals containing 95% of each set of components are also drawn (vertical lines). Because the confidence bounds from the two data sets overlap in all three components, the means of the reverse and normal modes cannot be distinguished at the 95% level of confidence; they pass the bootstrap reversals test. A final test is useful in paleomagnetism: the fold test (Chapter 9). If a rock has moved from its original position, was it magnetized in the original, in the present or in some other position? Moreover, is simple rotation about strike an appropriate method to restore the beds to their original positions? In the classic fold test envisioned by Graham (1949), (see Chapters 9 and 11), the directions of magnetization of a deformed rock unit are assumed to be most closely parallel in the orientation in which the magnetization was acquired. Therefore, if a rock has retained an original magnetization through a subsequent folding or tilting event, the magnetic directions may cluster most tightly after they have been rotated back to their original positions. This of course is not necessarily true for elongate data such as those shown in Figure 12.2a for which we can imagine pathological cases that result in a more tightly clustered set of directions in a coordinate system other than the one the data were magnetized in. Nonetheless, the clustering assumption is probably reasonable in most scenarios. The fold test appears at first glance to be simple, but it is not. The primary problem is that paleomagnetic vectors are never perfectly parallel. 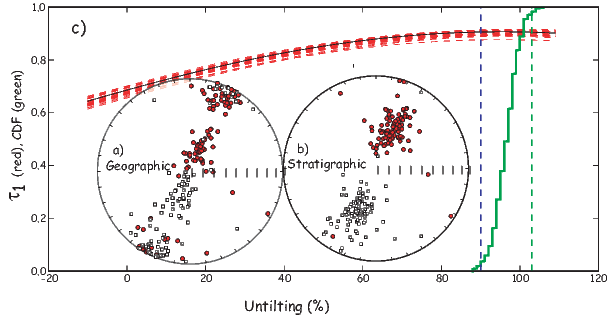 The scattered nature of the data means that a statistical test is necessary to determine whether clustering is “significantly” better in one orientation or another. In Chapter 11 we suggested that variances could be compared using an F-test, so it was long the practice in paleomagnetism to compare estimated precisions before and after tilt adjustment (McElhinny, 1964). The ratio of the two estimates of κ were compared with those listed in statistical F-distribution tables. Ratios higher than the F value for a given N were deemed to constitute a significant increase in concentration after adjusting for tilt, thus representing a positive fold test. This test can be done on the back of an envelope and is still in frequent use. Figure 12.8: a) Equal area projection of a set of directions in geographic coordinates. The data were drawn from the same distribution of directions that gave rise to the VGPs shown in Figure 12.1a. They have been rotated about strike on two simulated limbs of the fold, one to the northeast and one to the southwest, resulting in a streaked (girdle) distribution. The original polarity of many data points is ambiguous. b) Data from a) after back tilting by 100% of the original tilt. Polarities are more readily identifiable. c) Red dashed lines: trends of the largest eigenvalues (τ1s) of the orientation matrices from representative pseudo-samples drawn from a) as they evolve during untilting. The directions are adjusted for tilt incrementally from -10% to 110%. The largest value of (τ1 occurs near 100% in all of the pseudo-samples sets. The cumulative distribution is of 500 maxima of τ1 and the bounds that enclose 95% of them. These data “pass” the bootstrap fold test. Although its simplicity is a great strength, there are several problems with the classical fold test. First, the geomagnetic field has two preferred states and is not perfectly dipolar. Directions observed in paleomagnetic samples are therefore not only scattered but are often of two polarities. Second, the magnetic directions may be most tightly clustered somewhere other than in “geographic” or 100% tilt adjusted coordinates (McCabe et al., 1983). Finally, structural “corrections” are not perfectly known. Not only are the bedding orientations themselves often difficult to measure accurately, but detection of complications such as plunging folds, and multiple phases of tilting requires extensive field work. It is nearly impossible to assess rotation about the vertical axis on the basis of field relations alone, as it results in no visible effect on the dip of the beds themselves. Because of this uncertainty, we might reasonably ask whether if the data are actually most tightly clustered at, say 90% tilt adjusted (as opposed to 100%), does this constitute a “failed” fold test. We consider first the problem of dual polarity. We plot a hypothetical data set in geographic coordinates in Figure 12.8a and in tilt adjusted coordinates in Figure 12.8b. The polarity is ambiguous but the classic fold test requires calculation of κ which can only be done with data of a single polarity. Obviously, fold tests that rely on κ will not be straight forward with data such as these. An alternative approach is based on the orientation matrix (Tauxe and Watson, 1994). [Please read Appendix A.3.5 if you have not yet done so.] In the orientation matrix, polarity does not play a role and the “tightness” of grouping is reflected in the relative magnitudes of the eigenvalues (τ). As the data become more tightly grouped, the variance along the principal axis grows and those along the other axes shrink. Thus, examination of the behavior of τ1 during unfolding would reveal the point at which the tightest grouping is achieved, without knowledge of polarity. Suppose we find that the degree of unfolding required to produce the maximum in τ1 is 98%. Is this a positive fold test suggesting a pre-folding remanence or is the difference between 98% and 100% significant? For this we call on the by now familiar bootstrap. Numerous pseudo-samples can be drawn. We can then calculate the eigenparameters of the orientation matrix for a range of percent unfolding. Some examples of the behavior of τ1 during tilt adjustment of representative pseudo-samples drawn from the data in Figure 12.8a are shown in Figure 12.8c. The green line in Figure 12.8c is a cumulative distribution plot of maxima in τ1 from 500 pseudo-samples. These are sorted and the 95% confidence interval for the degree of unfolding required to produce the tightest grouping (the highest τ1) is thus constrained to lie between 97 and 102%. The data from Figure 12.8a are shown after 100% tilt adjustment in Figure 12.8b. The tilt adjusted data are not only better grouped, but now the polarities of most samples can be readily determined. An advantage of the eigenparameter approach is the fact that the data do not need prior editing to split them into normal and reversed polarity groups, which is a particularly onerous task for the data considered here. For small data sets, we could employ a parametric bootstrap, whereby pseudo-samples are generated by first randomly selecting a site for inclusion, then by drawing a substitute direction from a Fisher distribution having the same D, I, N, and κ. We can incorporate uncertainties in bedding into the bootstrap. If we assume that the poles to the bedding planes are Fisher distributed, and we can assign some estimated κ value to the distribution of poles based on repeat measurements (say, κ ≃ 30), we can draw poles to the beds from Fisher distributions using the assigned mean direction and κ. We would then use these simulated poles in the structural corrections on the pseudo-samples. This procedure would propagate the uncertainties in structural corrections through the fold test, resulting in more realistic confidence bounds on the peak in concentration during unfolding. Finally, it is important to remember that peaks in concentration between 0 and 100% unfolding can result from a variety of causes. Traditionally, intermediate peaks have been interpreted as resulting from remagnetization of the rock units during folding (see, e.g., McCabe et al., 1983). Such behavior could also result from failure to account for plunging folds, or vertical axis rotation between blocks (see Tauxe and Watson, 1994), so some caution should be exercised when interpreting fold test results. SUPPLEMENTAL READINGS: Fisher, et al. (1987), Chapters 2–5. Find the Chapter_12 directory (see the Preface for instructions.) This problem set will use PmagPy modules from within a Juptyer notebook. You can check the _PmagPy_nb.ipynb in the data_files/notebook directory for examples. a) Look at the data in Chapter_12/ps12-1a.di with the functions ipmag.plot_net( ) and ipmag.plot_di( ) . Do the data look Fisher distributed to you? Now check whether they are using the program ipmag.fishqq( ) from within a notebook. Are they? b) Repeat this exercise for Chapter_12/ps12-1b.di. c) Now rotate the data in Chapter_12/ps12-1c.di to the mean direction. 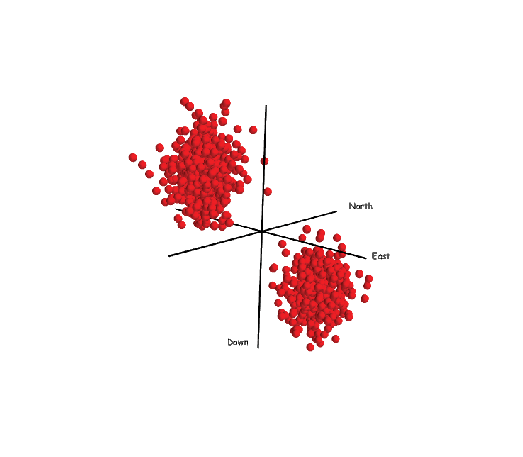 Do this by first determining the mean direction with ipmag.fisher_mean( ). Then use the function pmag.dodirot_V( ) using the mean you just calculated as the new coordinate system. Look at your output in an equal area projection – the center of the diagram will be the mean direction you used for the rotation. Why are these data not Fisherian? The data in Chapter_12/ps12-2.dat are D,I, dip direction and dip where the D and I are in geographic coordinates. Use the function ipmag.bootstrap_fold_test( ) to perform a fold test. Were the data magnetized before or after folding? The data in Chapter_12/ps12-3.dat are declination/inclination data from a (fake but typical) paleomagnetic study. a) First examine the data set in an equal area projection. b) Separate the data into two separate data arrays by polarity (see Chapter 11 problems). Calculate the Fisher means, and α95s (see Problem 1). Check if the data are Fisher distributed (see Problem 1). Calculate the Bingham ellipse on the whole data set using ipmag.bingham_mean( ). Calculate the Kent ellipses on the normal and reverse data sets using the function ipmag.kent_mean( ). Now get a set of bootstrap mean directions using pmag.di_boot and calculate the Kent ellipses for those with pmag.dokent being sure to set the NN value to unity. Make plots of all the confidence bounds with ipmag.plot_di_mean for the Fisher α95 and ipmag.plot_di_mean_ellipse for the ellipses. Which method seems to represent the character of the data the best? c) Now test whether or not the two modes in the data are antipodal. Use Watson’s V _w (ipmag.common_mean_watson) (see problems for Chapter 11) and ipmag.reversal_test_bootstrap to test whether the data pass a reversals test. Of course you have to flip the reverse mode to their antipodes first (try pmag.flip for that). Do the data pass? Watson’s V w test assumes a Fisher distribution, while ipmag.reversal_test_bootstrap uses a bootstrap and does not assume a Fisher distribution. Which do you think should be used in this case? Bingham statistics assumes that both polarities are antipodal with the same distribution, so you cannot do a reversals test. What are the advantages and disadvantages of the different methods for doing a reversals test? And if the data fail the reversals test, should you be calculating Bingham statistics on them?